Cohen Braithwaite-Kilcoyne | The Goose Is Out! We first came across Cohen Braithwaite-Kilcoyne as part of Granny’s Attic, at Leigh Folk Festival. We were blown away by Granny’s Attic, but particularly by Cohen’s fantastic singing and squeezebox playing. We saw him later the same year playing solo at Walthamstow Folk Festival, and basically knew we had to ask him to come to the Goose! He is one of the best musicians we have ever seen, bar none. And still so young (Goose spits feathers 😀 ). 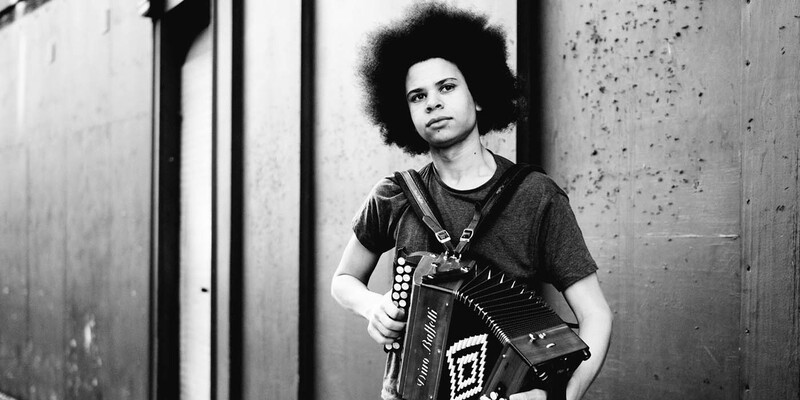 Cohen has been a musician since the age of 6 and took to squeezeboxes in his teens. He has since developed into a fine player of both the melodeon and anglo concertina. As an instrumentalist Cohen is experienced in playing for dancing, playing as part of groups, both as an accompanying and as a lead instrument, and playing as a soloist. Cohen is also a well-regarded singer and in 2014 won Bromyard Folk Festival’s Future of Young Folk Award for singing. Cohen has been performing for over a decade and in that time has played in countless groups. His solo repertoire consists mainly of traditional songs with accompaniment from anglo concertina or melodeon. Alongside this Cohen also performs traditional tunes and the occasional un-accompanied song. Cohen’s style, approach and repertoire is rooted in the English tradition, however material and influences from Scottish, Irish, American and European traditions are also present in Cohen’s performance. An average solo performance includes traditional ballads, historical songs, industrial songs, sea songs and shanties, with a fair amount of material linked to the West Midlands where Cohen has lived for much of his life. Cohen has been involved with a range of projects with various companies, organisations and charities, and in providing music for theatrical productions, both in researching and performing music for live shows. Click here to go to Cohen Braithwaite-Kilcoyne’s website!